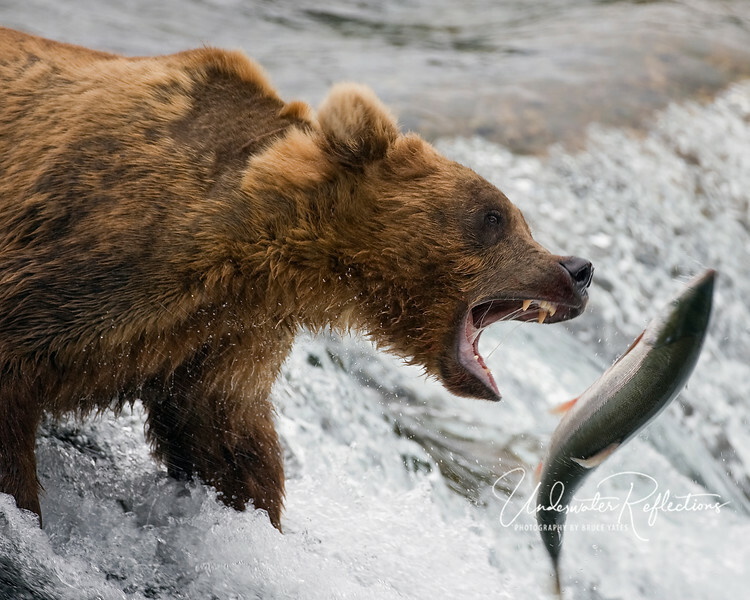 These are photos taken in Katmai National Park in Alaska in July of 2007, when huge brown bears feast on spawning sockeye salmon. I was very fortunate to get this shot of a classic scene -- a big male brown bear "fishing" atop the Brooks River falls. This was definitely my best shot of the trip. CAMERAS - Photos in this gallery were taken with four cameras: Canon 1D Mark IIN for most bear shots; Canon 5D for wide angle; Canon 20D (Cheri's); and Panasonic/Lumix LX2 ("point & shoot" for pocket use). Most bear shots were taken with a Canon 500mm f/4 lens, a few supplemented by a 1.4X or 2X teleconverter (for effective focal lengths of 700mm or 1000mm). Great action shot, beautiful photograph. Awesome capture...definitely a classic scene that never gets old! !